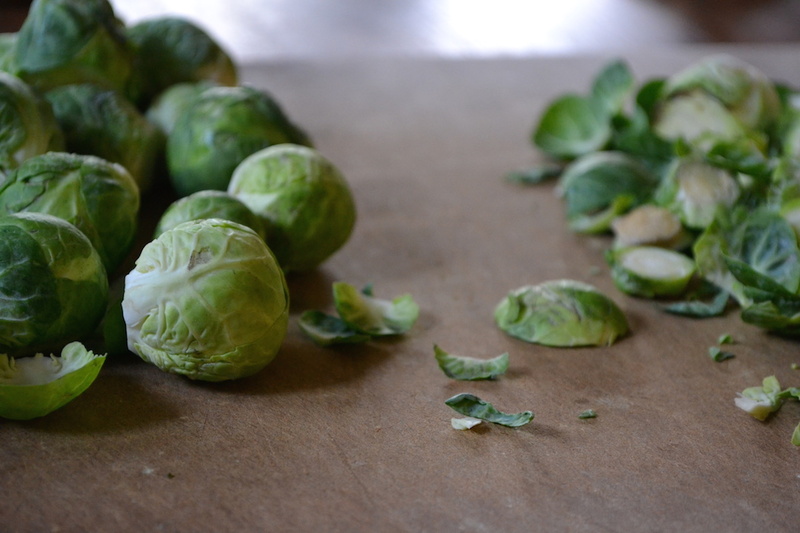 Many people do not like Brussels Sprouts. This is a fact. I teach cooking classes and offer in-home catering and one byproduct of this is that I learn a lot about what people like and don’t like to eat. List broccoli, sweet potatoes, or green beans on a menu and a client won’t bat an eye; suggest Brussels Sprouts and you get an earful. Professions of hate, tales of mothers standing over cauldrons of simmering Brussels Sprouts for hours at a time to make sure they are mush, and my favorite, the clarifying statement that they love Brussels sprouts, but don’t want to offend any guests by having them on their table, are all laments from clients that I have heard over the years. To be fair, some generously say that with a professional helping them prepare them they are willing to give them a second chance. Yet the eyes of even these open-minded souls still narrow as they look on with disgust when its time to actually prepare the offending green orbs on their counters. I like Brussels sprouts and have waged a somewhat successful, if small-scale, PR campaign on their behalf over the years. Despite the strong reaction they elicit, I still include them on menus and through the technique of pan-searing (which yields crisp and nutty Brussels sprouts) have turned haters into lovers. Yet my work is far from done and for those who still sneer at the thought of Brussels sprouts on your table, I’m hoping to tempt you into trying them with this winter slaw recipe. 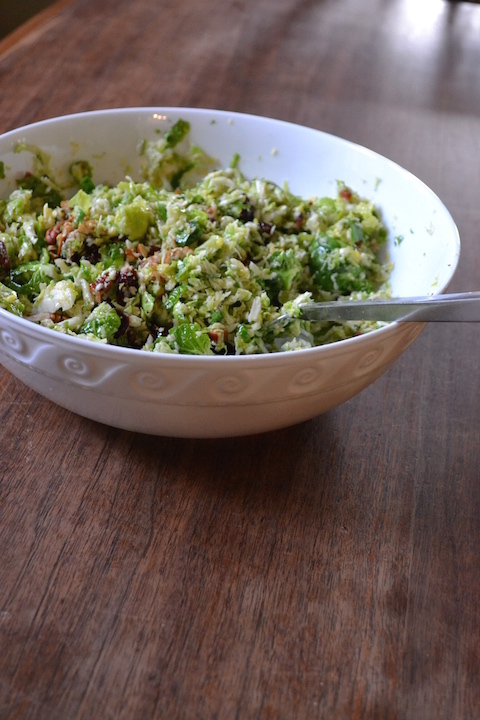 A Dijon vinaigrette coats crisp shredded sprouts, tart dried cranberries, salty bacon, and toasted pecans for a side dish that just might have you saying yes to Brussels sprouts. Happy cooking! 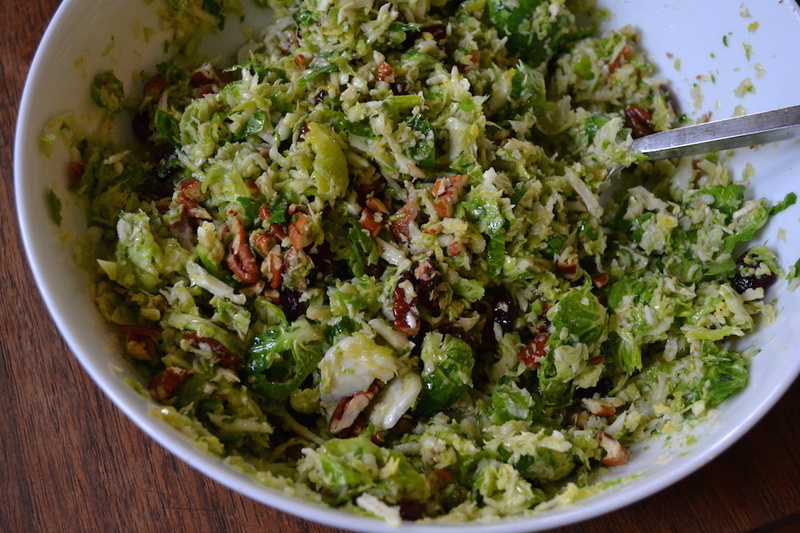 Use the grater attachment of a food processor to shred the Brussels sprouts. Set the shredded sprouts in a large bowl. In a medium frying pan, fry the bacon over medium heat until cooked and crispy. Let cooked bacon cool on paper towels and then roughly chop. 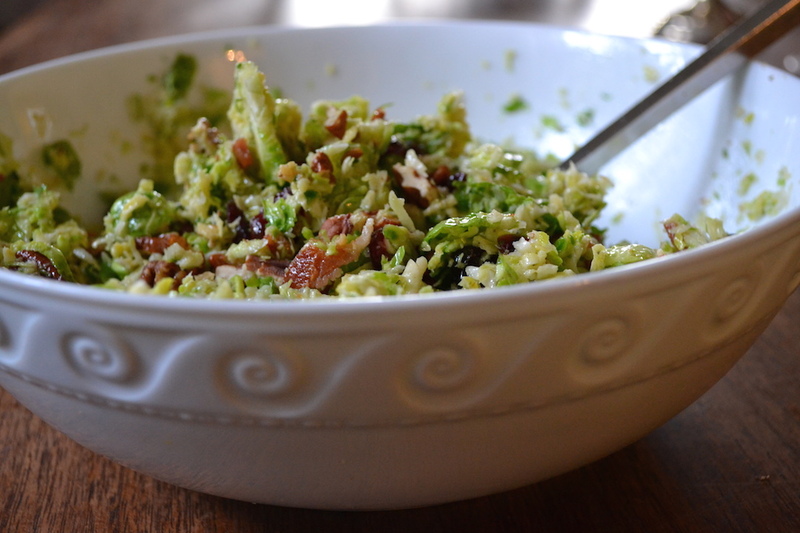 Add the chopped bacon, dried cranberries, and toasted pecans to the shredded Brussels sprouts. Toss to combine. Add the vinegar, honey, Dijon mustard, and garlic clove to a blender. With the blender running, slowly drizzle in the vegetable oil to make an emulsified dressing. Season to taste with salt and pepper. If needed, add a little more vinegar. Pour the dressing over the slaw and adjust the seasonings as needed. Let slaw sit for at least 15 minutes before serving. Slaw can also be refrigerated and serve chilled. Lovely! I have to say – Brussel sprout is one of my favourites… My problem is rather that I run quickly out of methods how to prepare it. So, I am gonna add this recipe to the list 😉 Thank you! Enjoy! And please let me know how it turns out.